AFDA, the South African School of Motion Picture Medium and Live Performance, has awarded local filmmaker Thabo Vincent Mhlamvu a bursary for undergraduate study for three years at the new campus in Glen Anil, Durban. The 100% bursary award, which was given to Mhlamvu at the eThekwini Film Awards on Saturday, 24 November, was initiated by local filmmaker Bonie Sithebe, who facilitated the callouts for applications to this specific bursary award.The Film Awards was hosted by the eThekwini Filmmakers Association (eFA), a non-profit organization, which aims at improving and developing the local film industry and audiences for local films, and creating an economically viable film industry in the city. eThekwini Deputy Mayor, councillor Nomvuzo Shabalala, the guest speaker at the awards encouraged young and emerging filmmakers to hone and develop their craft through institutions such as AFDA. 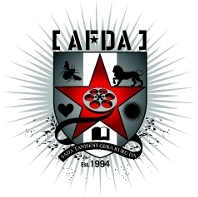 AFDA has campuses in Johannesburg and Cape Town, and will open its doors at in 2a Highdale Road, in Glen Anil, near Durban North in January 2013. For more information contact Milena Gevers on [email protected] or call 031 569 2252.